Opinion: The Trump-Kim Summit Sets a Dangerous Precedent. It was the Right Call Anyways. In what may have been the most dangerous diplomatic gambit of the twenty-first century, Donald Trump and Kim Jong-un met Tuesday in Singapore in a summit reminiscent of those held between Soviet and American leaders. Although the United States is no stranger to neutral-ground relations and meetings regarding national security, the Trump-Kim summit is unprecedented in its scale and scope. That’s a stark departure from Tuesday’s meeting, which Trump has characterized as an effort to achieve a “real deal.” Only four presidents have reached an agreement regarding the active threat of nuclear weapons, most notably Richard Nixon during the 1972 Moscow Summit, which limited the proliferation of anti-ballistic missiles and began widespread disarmament. Trump also approached the deal alone, which has historically been uncommon in summits of such importance. Especially following World War II, leaders of the United States were often joined by executives from other friendly nations. Charles de Gaulle, Winston Churchill, Harold Macmillan and others took part in meetings, in part to engage in diplomacy and stand in solidarity, but also to ensure peaceful negotiations. Any interpretation of precedent would say that the outcome of the Singapore meeting would have been unpredictable, if not downright dangerous. Both leaders have shown themselves to be impulsive and they both almost singlehandedly control their nation’s policy. One could argue that never has so much power been concentrated in one single meeting. Certainly, this is not the diplomacy that United States wants to normalize. If the G7 summit is any indication, most of America’s allies are opposed to dramatic shifts in policy and the sudden nature of Trump’s decisions. But this was North Korea Trump was meeting with. This is a North Korea which has engaged in similar tactics since the time of Kim Il-sung, and one that regularly practices government with the same apparent whim and grandeur that Trump is known for. In this respect, Donald Trump and Kim Jong-un would make very compatible diplomacy partners. Schumer is right, a meeting with the Kim does accept the rule of the Kim family. But this isn’t a problem. In fact, meeting with an oppressive regime is often the first step to softening the rigidity of the state and engaging in long-term diplomacy. The United States has used this tactic for years, first meeting with Stalin between 1943 and 1945 and later sending Richard Nixon to meet with China’s Mao Zedong in 1972. For North Korea, this visibility is one of the major incentives to agreeing to a meeting with President Trump. Kim Jong-un can now take his place among the pantheon of world leaders, which has only been confirmed by other meetings with China, Singapore, and South Korea. 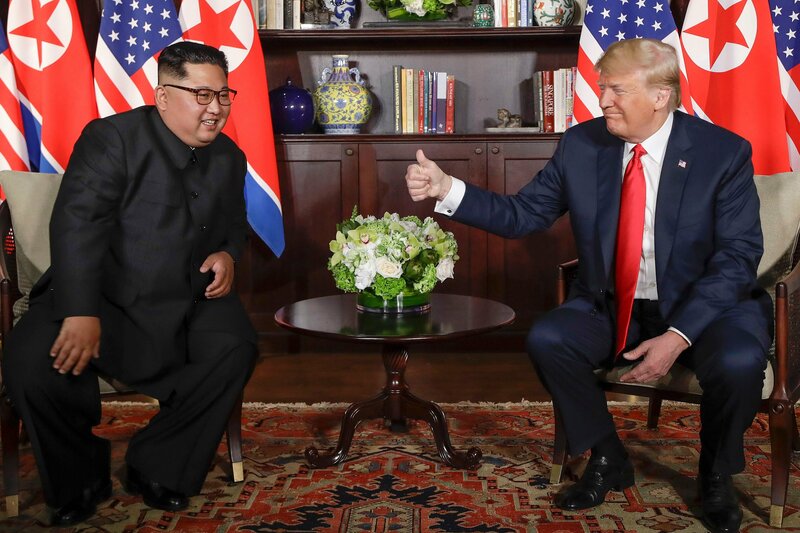 Kim can also use the summit to help with his internal legitimacy; state-run media in North Korea can depict the Supreme Leader shaking hands with the leader of the free world. As a result, Kim had an incentive to engage in peaceful diplomatic relations with the United States, even if it yielded few concrete resolutions. A failed meeting would have been disastrous for Kim’s regime both internally and externally, and subsequent nuclear retaliation would likely have meant the end of Kim’s rule. As for the United States, this is a first step towards normalizing relations with the North Koreans and backing away from the brink of nuclear war. The Singapore meeting serves a solid bedrock for relations between the two states, and although the United States should approach future summits with extreme caution, President Trump was right to engage with Kim Jong-un.